Place the sweet potato chunks in a large stock pot and cover with 1” of water. Add in a large pinch of salt. Bring to a boil over high heat, reduce heat and simmer until the sweet potatoes are fork tender, but not mushy, about 12-15 minutes. 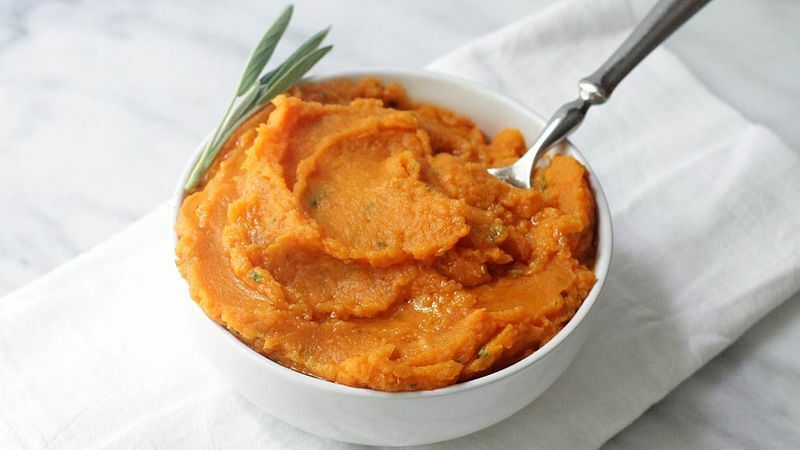 Drain the sweet potatoes and then transfer to the basin of a food processor (you might need to work in batches, depending on the size of your food processor). Pulse until the sweet potatoes are smooth. Add in the sage, olive oil, additional salt (if desired) and pepper. Pulse until smooth. Serve immediately. If you don’t have a food processor or prefer chunkier “smashed” potatoes, just return the potatoes to the pot after draining, and then mash using a regular potato masher. Add in the sage, olive oil, salt and pepper, and mash until well combined.